Featuring Landau All-Day's unique mechanical stretch fabric, this top offers side vents and a drop tail hem, providing a contemporary look with a full range of motion. Plus, you'll love the timesaving convenience of the instrument divider in the chest pocket. Designed to fit both men and women, this top offers maximum comfort and durable good looks. Center back length: 29". This natural-rise cargo pant features Landau All-Day's unique mechanical stretch fabric for all day movement. Exposed full-elastic waist with front drawstring and handy silicone grips ensure a snug, secure fit. Side vents with notched hem detail and a stylish flare leg opening provide contemporary flair. Two roomy top-applied hip pockets and a cargo pocket with instrument divider let you keep whatever you need right where you need it. Regular inseam: 31". Petite inseam: 29". Tall inseam: 33". You're sure to make a statement in this contemporary-fit warm-up jacket with mechanical stretch. Offering a snap-front closure, jewel neck and rib-knit sleeve cuff, this warm-up has everything you need to stay moving. Featuring two spacious top-entry pockets, side vents and back waist darts, it provides exceptional shaping and style. Look great on the job or wherever life takes you. Center back length: 28⅜". The style you want meets the features and flexibility you need in this eye-catching tunic with mechanical stretch. A Y-neckline with box stitched placket and notched side hem detail give this tunic a touch of class while two roomy top-entry pockets (one with instrument dividers) provide ample storage. If you're looking to add a staple to your wardrobe, this is the top for you. Center back length: 28⅛". 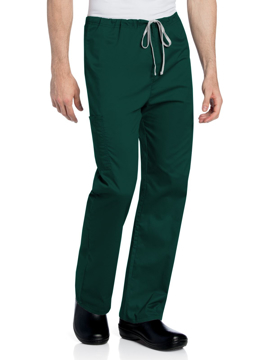 Dual waistband features a flat front and elastic back waist with internal drawstring. Waistband includes hidden snap closure and belt loops, with fully functional zipper fly. Two angled hip pockets, a vertical side seam welt cargo pocket with secure Velcro closure, a horizontal welt cargo pocket and two back patch pockets give you the extra storage you need. Angled knee darts provide ease of movement. Regular inseam: 31". Petite inseam: 28½". Tall inseam: 33½". Made of ripstop stretch material and featuring double needle stitching, this top can handle even the hardest shifts. Keep track of your items with a patch chest pocket featuring angled loop -perfect for clipping your badge or pens. The stylized back yoke detail includes a handy locker loop, and side vents with drop-tail hem providing extra coverage. Center back length: 30". Your go-to workday top in comfortable stretch fabric. A men’s v-neck top with forward shoulder and back yoke. Chest pocket with instrument pocket and bungee loop. Side slits at the hem. Center back length: 30¼". A men's v-neck pullover top including one breast pocket with pen division, set-in sleeves, and felled seamed back yoke with a 2" vented mesh gusset. Center back length: 30". This classic unisex cargo pant features a full drawstring waist with plenty of storage options. Two roomy layered cargo pockets and an additional back pocket give you room for all your essential gear. Regular inseam: 31". Petite inseam: 28½". Tall inseam: 33". A classic rise, straight leg reversible unisex pant with drawstring. Features a relaxed hip, seat, and thigh for ease of movement. Regular inseam: 31½". Petite inseam: 29½". Tall inseam: 34½". Reversible v-neck top with reinforced neck facing, dolman sleeves and breast pocket on both sides. Center back length: 27½". Tall center back length: 30". A women's cardigan style three-button warm-up jacket with five pockets, including two cell phone pockets and one inside pocket. Center back length: 29½". A women's crew neck drawstring warm-up jacket with tunnel drawstring ties at the back and two front patch pockets with a cell phone pocket. Center back length: 30". Flattering v-neck design, banded trim and accent piping. Princess seams on the front and two angled pockets and four deep lower pockets ensure this top will be a favorite. Center back length: 25⅞".